Students in underserved urban communities often lack access to educational opportunities in STEM (science, technology, engineering, and math). Evidence reveals a lack of STEM access in urban environments, displaying a clear pattern impacting predominantly impoverished neighborhoods the hardest. The issue of STEM education in urban schools reflects an increased interest in expanding and diversifying the future workforce to compete in a STEM-centered future. STEM has been positioned as a critical part of urban education reform efforts and a potential vehicle to broadening participation in STEM. In various US cities, schools labeled as failing are being repurposed as selective STEM-intensive academies to build a STEM education infrastructure. 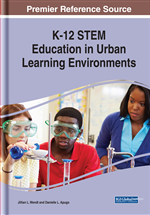 In this chapter, the authors discuss the barriers associated with urban STEM education and how this underserved population is a vital vehicle to increase diversity in STEM. These identified challenges can be directly articulated to the dearth in effective implementation policies and best practices that are designed to ensure and improve equal access to STEM education. As a result, invested stakeholders struggle to provide students with the STEM experiences required to be competitive for the 21st century, regardless of college and career aspirations (Indiogine, 2015). In particular, state and local education agencies and school-level educators struggle to close persistent achievement gaps in core subjects, specifically in mathematics and science (Indiogine, 2015; Morgan, Morgan, Farkas, Hillemeier, & Maczuga, 2016). While STEM faces many nuanced challenges, by far the biggest and most agreed upon, is lack of a sufficient STEM-skilled talent pool (Carnevale, Smith, & Melton, 2011). This is particularly vexing considering that the number of STEM-related jobs has increased by ~30% in comparison to non-STEM jobs over the last decade. Past estimations predicted that more than two million STEM jobs would go unfilled. (Carnevale, Smith, & Melton, 2011; Rothwell, 2014).